Of any one food, blueberries may be the quintessence of summer. With these 95 degree days and Independence Day just around the corner, blueberries and strawberries are where it’s at. All the home magazines profile blueberries for their July issues, and people just go blueberry crazy. I’m not a huge fan of just eating plain blueberries, but I do appreciate a good blueberry cobbler or some such. And now, so you can impress everyone at your next cocktail party, Blueberry Trivia! While Maine is the leader of lowbush blueberry production in the United States, (and possibly the world, but Wikipedia didn’t seem to be very clear on that), Michigan is the leader of highbush production. 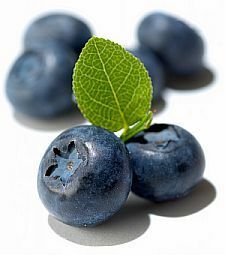 Different species of blueberries are found all over the world. North Carolina has pretty good ones. My dad loves blueberries! He has a huge blueberry bush in the backyard, but they’ve already ripened and been picked. Although blueberries are not among the most contaminated and therefore aren’t officially part of the Dirty Dozen, there’s still a lot of question about them. It’s probably best to just buy organic. Sorry, you missed the North Carolina Blueberry Festival, which is held annually in Pender County every June. Don’t worry, more are still to come! The Blueberry Council keeps a list of upcoming blueberry festivals. And if I have any readers up north, happily for you, blueberries and their attendant festivals are still in season for a couple more months. Color layering technology was just being developed when Denise Nickerson, the actress who portrayed Violet Beauregarde in Willy Wonka and the Chocolate Factory, needed to be blown up like a blueberry. They were able to turn her face blue, but not her hair. Trivia Bonus: Where Is She Now? Denise Nickerson is an accountant and single mom in Denver, Colorado.